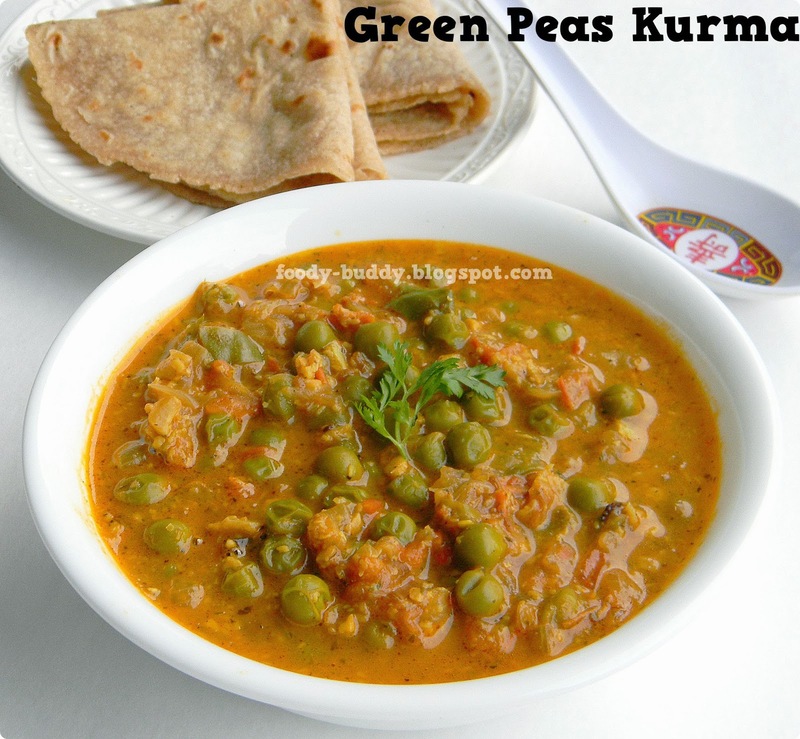 Today I am sharing my amma signature recipe of Green Peas Korma which is very close to my heart. My mom makes this pattani kurma at least once a month as side dish for chapathi, phulka and also it tastes good with dosa. I prefer to use frozen peas, you can also substitute it with fresh or dries peas along with potato or any other vegetable of your choice. Coconut, cashews, yogurt along with other aromatic spices are used for this kurma. Addition of mint gives a nice flavor to the dish. You can also make kurma as a side dish for pulao. 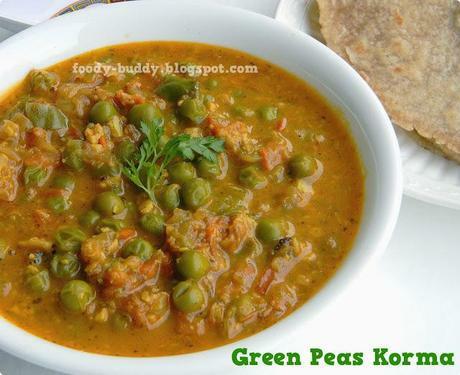 Try this green peas curry and let me know how it turned out. In a blender(mixie), add all the ingredients listed under "To Grind" List, grind it to a smooth mixture. Heat oil in a pressure cooker, add fennel seeds, cinnamon stick and curry leaves, after they sizzle, add chopped onion and little salt, fry this for few mins until they turn golden color. Add chopped tomatoes, fry this until they turn soft and mushy. Add garam masala, turmeric powder and ground paste, fry this for few mins until raw smell vanishes. Add little yogurt and green peas, mix well with the masala. Add enough water and milk, check the salt, close the lid and cook it for 2 whistles. Turn off the flame. Finally garnish it with chopped cilantro. Flavorful green peas korma is ready to serve with hot chapathi or phulka. If you are using fresh green peas, steam it or pressure cook it for 3 whistles until they turn soft, then follow the recipe. You can also add few drops of lemon juice after pressure cooking for more tangy taste. If you don't like fennel seeds, just do the tempering with cinnamon and curry leaves. Addition of cashews gives a nice taste to the korma. Mint adds a flavor to the kurma. If you don't have green peas, use any vegetables of your choice by following the same recipe. Anti-aging, strong immune system and energy.